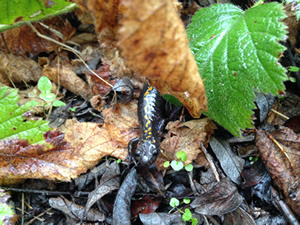 IWRP has been able to assist several agencies with projects to aid in recovery of listed species, specifically the Central California Coast steelhead and Coho salmon, the Santa Cruz long-toed salamander (SCLTS), and the California red-legged frog (CRLF). The TAC has formed subcommittees to focus on these species. IWRP has been able to implement over 150 projects in 3 counties in just over 10 years. With initial investment from the State Coastal Conservancy for coordination, design and permitting, the local RCDs, using their limited tax base, and IWRP coordinator have been able to leverage this to receive over $17 million in grant funding for implementation of projects. 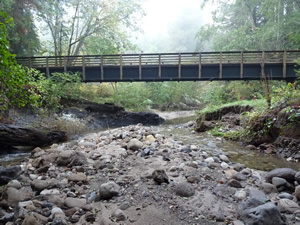 Through federal, state, local and private grants, high quality, priority projects are occurring in multiple watershed to improve their overall environmental condition. The extensive network of rural roads in all three counties is a major contributor of sediment to fish‐bearing streams. The RCD of Santa Cruz County established the Rural Roads Sediment Reduction Technical Assistance Program to help private road associations assess erosion issues and design and implement solutions. As of 2008, the program had prevented an estimated 7,600 tons of sediment from entering the waterways (updated information is being collected for work since then). IWRP helps support this program and has expanded it to San Mateo and Monterey Counties. A road-related erosion control guide is being developed for the three counties and all three RCDs have hosted training workshops for road associations, contractors and County staff. The IWRP TAC process has evolved into a respected process for mediating conflicts between resource agencies and landowners, and providing technical assistance to develop projects that all parties can support. 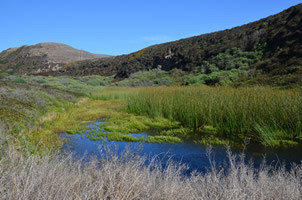 Examples of past and current projects include: the Branciforte Dam removal, the Watsonville Fish Ladder and Bypass Flow Agreement, restoration of the Molino Pond and pending 1707 Dedication of Riparian Water Rights, addressing long‐standing and intractable instream flow and water rights issues on Pescadero Creek, and facilitating the first of its kind collaborative design process with Caltrans and the IWRP TAC for the Scotts Creek Bridge Re‐build. IWRP has been a critical testing bed for a variety of innovative tools to provide incentives for public and private partners to implement ecosystem restoration projects. One of the greatest barriers to restoration is the difficulty in navigating the permit process. More information on this can be found in the Permit Coordination sub-page. When the Resource Conservation District of Santa Cruz County (RCD) and the U.S.D.A. Natural Resources Conservation Service (NRCS) offer farmers and landowners technical assistance or cost sharing for conservation practices, it has traditionally been the responsibility of the customer to obtain the associated permits. Permits or other forms of approval are typically required by one or more regulatory agencies, such as U.S. Army Corps of Engineers or the California Department of Fish and Game, prior to construction. That process of applying for, obtaining, and paying for permits has been recognized as a significant barrier for farmers and landowners wanting to implement voluntary conservation measures. In 2005, the NRCS, RCD, and Sustainable Conservation’s Partners in Restoration Program created a 5-year Permit Coordination Program for Santa Cruz County to streamline the permitting process for fifteen conservation practices from the NRCS Field Office Technical Guide that can be utilized for projects designed for erosion control, stream restoration, and wildlife habitat enhancements that require permits from one or more of the regulatory agencies. In 2010, the RCD renewed this Program for the next 10 years (2010-2019). The permits and agreements that are issued by the regulatory agencies for this Program are valid for ten years (with the exception of the Master Permit from the County which must be extended after the five (5) years), and the Army Corps of Engineers and Regional Water Quality Control Board which can only issue 5 year agreements. This coordination process places additional responsibility on NRCS and RCD staff to include regulatory conditions in the project designs and specifications, monitor the activities to ensure that the conditions of the permits and agreements are met, and report back to the regulatory agencies on a regular basis throughout the year. However, it makes the permit process much simpler for the landowner by allowing certain types of restoration projects to use a streamlined process, saving time and money while still ensuring environmental protections are maintained. For additional information on PIR in your county, contact your local RCD. After the infamous 2008 Bond Freeze, the IWRP steering team and local partners realized that the long‐term viability of IWRP was contingent on developing a suite of local funding mechanisms. 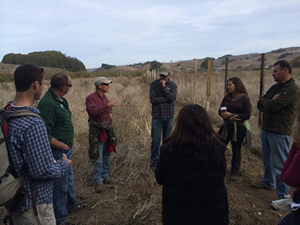 IWRP and the RCD of Santa Cruz County took the lead in developing new local funding sources as well as ensuring that existing local sources be used for local projects in a coordinated way to best benefit the natural resources and help support local economies. Santa Rita Riparian Restoration: this was the first urban stream restoration in the Salinas watershed, converting an eyesore ditch to a community resource and source of pride. Developed Watershed Cruzin’, a watershed activity guide for grades K‐12 to get students involved in watershed restoration and monitoring. This is a companion piece to Coastal Commission’s coastal activity guide and is transferable to other regions. The RCD worked with the County of Santa Cruz to install road signs identifying every stream and watershed boundary in the county, helping to raise awareness of which watersheds people live in. Over the past 10 years, IWRP, through the RCDs, has increased stakeholder engagement in conservation. The list of landowners and partners that have been involved in IWRP can be found in the Partners tab.